Here it is, as readers like you requested, the New Bright Mud Slinger! Well, at least it's one of them. Mud Slingers come in 5 different sizes ranging from 1/15th to 1/6th scale, each with a different chassis and different performance. I decided to pick two of the ones I commonly saw in stores. This page here will cover the 1/14th scale version which I got from Target. You can also see my separate review of the 1/10th scale New Bright Mud Slinger that I found at Toys R Us. The 1/14th and 1/15th differ in that the 1/14th reviewed here includes all needed batteries, with a rechargable 6V pack for the vehicle, while the 1/15th version uses 5 AA's in the car, and no batteries are included. Other than the battery setup, they're essentially the same. You'll likely find the 1/15th scale version at Wal-Mart. 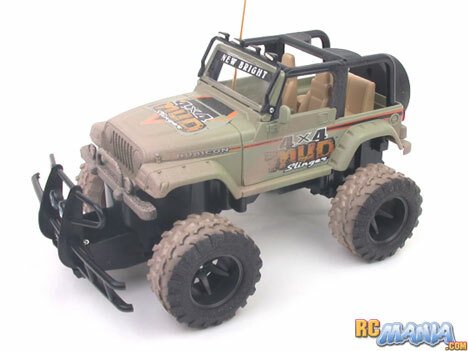 Obviously the 1/14th scale is a better deal with the rechargable pack, and it will also have just slightly more power off-road, but slightly less top speed on the street. Several different body styles are available for each size of Mud Slinger, but amongst any one of those sizes, the chassis and features will all be the same -- the body is just swapped out for looks, and some use the 27mhz frequency for their radio while others use 49mhz. The 1/14th scale New Bright Mud Slinger both looked and felt very familiar to me. As it turns out, I had tested essentially the same vehicle before, only that was the version that uses AA batteries, and didn't have the fake "dirt" splatters painted on. Like the Dodge Ram, this Mud Slinger has pretty good speed and responsiveness for its size. It feels fun and lively. It has no suspension and the tires are pretty hard, but at least it doesn't have stiff bouncy springs like a lot of other RCs out there. It is great when driven on a hard, smooth, surface, and still holds its own when taken onto dirt. Ground clearance is limited, so you can get stuck on rocks and dirt clods if the terrain gets too rough, but on gravel and moderately flat dirt surfaces, the Mud Slinger gets around just fine. I actually feel that the New Bright Mud Slingers in 1/14th scale are good RCs for kids as young as 5, though the recommended age on the box is 8. The vehicle is easy to drive, fun, good-looking, nicely detailed, pretty safe, and rugged. My only beef is with the price. For $35, I wish I could get a slightly larger vehicle, but the inclusion of all needed batteries does help sweeten the deal. Just do keep in mind that in spite of the name, this vehicle is not waterproof, so it should not be driven through actual mud!